The entries below all come from another part of the Blue Badge guiding course that I started in September 2014. As well as being able to guide people around sites in London, we have to be able to conduct tours of the National Gallery, talking for about 5 minutes on 20 paintings that are representative of the development of Western European art. We have to be able to do this without notes, so it means learning quite a bit about the pictures and the artists, and being able to express this in a reasonably engaging fashion. This isn’t art history – it’s about trying to communicate information in an entertaining way with the hope that one’s listeners both learn something they didn’t know and enjoy the experience. As I work my way through the 20 pictures I’ll post my notes up here. Once done I’ll link them so they follow the route that would be done in the Gallery (they’ll be posted here out of order). All images are taken from the National Gallery website and link through to the larger images on their site. 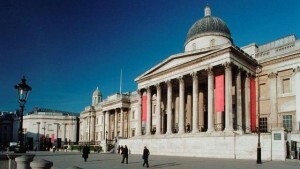 The National Gallery was established in 1824 – relatively late compared to other major European cities. It came about when the artist and collector George Beaumont agreed to leave his collection to the nation, but only if the government purchased the collection of the banker John Julius Angerstein and provided suitable accommodation for the collection. In April 1824 Parliament voted to spend £57,000 for Angerstein’s collection and to take the lease on his old home at 100 Pall Mall to house it. Beaumont’s smaller collection joined this one in 1826. 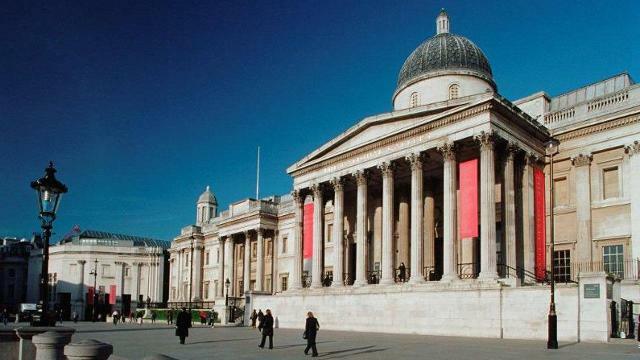 There was public criticism of the space with unflattering comparisons made between 100 Pall Mall and the Louvre or the Prado, and in 1831 the government agreed to construct a building to house the new national collection on the north side of the new Trafalgar Square. Even after William Wilkins’s gallery building was completed in 1838 space was at a premium. The building was shared with the Royal Academy until they moved to Burlington House in 1868, but since its foundation the gallery had been acquiring paintings and had received many bequests of collections. The biggest of these was Turner’s, who left over 1,000 of his own watercolours, drawings and oils, which had to be displayed elsewhere – first at Marlborough House and then at the new South Kensington Museum (now the V&A). The Trafalgar Square building was gradually expanded, and in 1897 the National Gallery, Millbank was opened to display the British Art in the collection. This was funded by the Sir Henry Tate and eventually became the Tate Gallery (now Tate Britain). Further extensions came in the 20th century and in 1991 the Sainsbury Wing was opened. Designed by the firm Venturi, Rauch and Scott, the wing houses the medieval and early renaissance works. The original plans for the extension provoked Prince Charles’s infamous ‘monstrous carbuncle’ speech – a competition to design the new wing had been won in 1984 by the practice Ahrends, Burton and Koralek. After Charles’s intervention the plans were scrapped and a new competition set, the result being the unthreatening building that stands today. Entry to the Gallery is free – and always has been, ever since its creation, and the opening hours can be found here. If you’d like me to take you round the Gallery, I do regular tours via AirBnB Experiences. Details and dates here. This entry was posted in National Gallery and tagged art, national gallery on 18/02/2015 by donbrown.